How To Generate More Leads by Adding Quizzes to Content? Article by Mark Gill(Writer and Marketing Expert at Opinion Stage). How Online Quizzes Help You Generate Qualified Leads? In the world of online marketing, success is measured in two stages – lead generation and conversion. It won’t be wrong to state that the former is of greater importance as it has a direct impact upon your conversion rate. There are several strategies that you may have already tried to generate fresh and qualified leads. While some of these strategies may have offered great returns, others would have failed to achieve desired goals. As a seasoned marketer or business owner, you would always like to explore new strategies that help in lead generation. Online quizzes have emerged as the best strategy for lead generation. They are extremely easy to create and deploy and at the same time engage your users more actively. The fact that quizzes add a new dimension to your marketing strategy and lend freshness to your campaign compared to traditional marketing techniques adds a novelty factor to them. You may have already seen many organizations use quizzes to break the ice with new users and convert them into their customers. You can either opt for trivia quizzes or personality quizzes each of which offers countless incentives to your marketing campaign. You won’t require advanced technical skills to get started with your quiz based marketing campaign. An online quiz maker would let you create a quiz and deploy it on your website, social media page or other platforms in a matter of minutes. If you choose the right online quiz maker you won’t drop a sweat in creating the most engaging quizzes that help you generate highly qualified leads. They Are Engaging – Any form of marketing strategy is bound to fall flat if it isn’t engaging. If your users don’t see any form of gratification in participating in your marketing campaign they are likely to skip them. Quizzes are highly engaging for the audience. If it is a trivia quiz, the user would be able to test his/her knowledge. In the case of personality quizzes, they get insights into their own personality which is both entertaining as well as informative for the user. They Help Socialize – We live in a world where the Internet has become the go-to space for socializing. People love to share about their lives and experiences on the social media. If you create engaging quizzes using online quiz maker your users would love to share them within their social network. This gives them the space to build their social status and you would gain in the form of promotion which can help you gather new leads. They Influence Users – It has been proven beyond doubt that social media influences buyers’ purchasing decisions. Most users love to shop for brands that have a higher social presence. When you launch a quiz and users take it they would be influenced to do business with your brand. 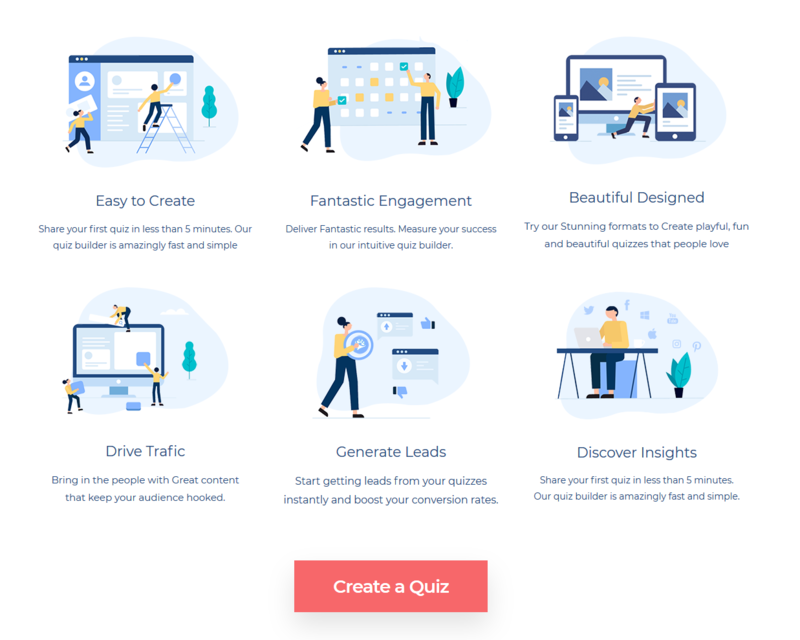 Since these quizzes offer you insights into the users’ minds you would be able to generate highly segregated leads and run the most targeted campaigns. Why Should You Use An Online Quiz Maker? Ease of Use–You don’t need to have knowledge of rocket science or HTML coding to create your quiz. If you have basic computer skills you can create your own quiz using an online quiz maker and launch within less than 5 minutes! Inspiring Designs – You don’t have to work with a design or graphics tool to create those eye-catchy designs. Quiz makers have inbuilt design tools and a library of graphics and stock images that help you add visual delight to your quiz. Traffic & Leads – An online quiz that is visually attractive and has engaging questions will immediately drive traffic to your website or social media handles. They spread virally and allow you to generate the most qualified leads. Get Insights – When you run personality quizzes you would be able to gather insights about your users which help in your future marketing efforts. As a marketer, you’d know the importance of getting inside the minds of your customers. Result Measurement – Online quiz makers come with tools that let you measure results and KPIs. You would be able to explore more on the strengths and deal with the weaknesses to make your future campaigns more engaging. What are you waiting for? Choose the best online quiz maker and launch your first quiz today. The results would definitely encourage you and build a powerful list that helps you stay go ahead of your competition.